Paramount Business Jets Recognized as Fastest-Growing Private Jet Charter Company in U.S.
Bo, the Obama family’s family dog, flew via private jet to meet the presidential family; and it has drawn negative criticism from the media and the conservatives. Shortly after its publication, the article became the subject of criticism of conservative blogs and news reporters. The presidential family travelled in a Gulfstream GIII/G3 jet, because Air Force One was too large to land at the Hancock County-Bar Harbor Airport in Trenton, Maine. I’m a person with server disablity and on SSI, Obama cut SSI back big time. Now he’s wasting the money he claimed he took from me to eat, get medical treatment, pay to have clothes on my back and roof over my head, now I had to move out of my a good section 8 housing the the wrose wherte we have rats and cockroches and also is so dirty and have hardly working A/C in hot summers and heater in the winter. Also only have $30 a week to shop at the Doller tree for food and that very limited pickens on food and had not had new clothes sents the cut back! Now I know the money that was taken from is being used to give Bo when need Privite jet,.. he’s a dam’n dog and Obama also waste the saved Gov’nt money he claimed to be saving on stupid stuff or puttimng in his own pocket! I say give the money back to me and others with disablituies,.. don’t pocket and spend on stupid crap! Easy now. He still manages to perform well in other areas of his presidency. He’ll come around. We just have to wait. That’s taken into consideration. 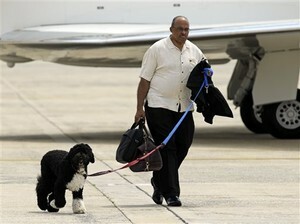 But, either way, Dogs aren’t supposed to fly on private jets. In times like these, when people are broke and unemployment is so high, it’s galling that the President would fly somewhere for a vacation and take two jets, at the tax payers’ expense. The bottom line as Americans are looking for jobs and getting un-employment what is BHO doing Jetting around at tax payers expense. How can Obama relate to the tax payer that works hard can’t even come close to the perks Obama’s has. I think BHO is a pathetic hypocrite. This is truly awful. Obama is a fraud. If this isn’t true then where are the jobs? Where are the immigration policies? Why are so many retired Veterans having their care cut? He’ll get there. He’s just afraid of making mistakes for now. He didn’t exactly inherit what you would call a great economy. He needs more time. Well, for those of you that voted for the idiot to prove you weren’t predjudice, are you going to vote for him again to prove you’re the idiot??? His record of spending proves he has never managed a business, nor does he know how to surround himself with the ones that have. All he knows to do is print money, thus causing our dollar to degrade on the open market. Takes away from those of us who do know how and from the ones they are supposedly helping. Anyone out there see what I do??? The government is our servant, not us theirs. Victor has now launched a commercial charter service that provides seats for dogs on planes. Private Jet Daily is the one source for news regarding the Private Jet and charter industry. The benefits of flying private are simply to avoid the airport, fly on your own schedule and avoid the hassles! And if researchers Grove and Prince are correct, the average Jet owner can avoid the hassles with a yearly income of $9.2m and a net worth of nearly $90 million.